I am not one to tempt fate or superstation, so when exiting my car at the grocery store this week I was astounded to find not one, not two, but three pennies. Oh, the luck! But what’s unlucky is looking like a goofball crouching down in the parking lot to pick up dirty pennies, and then having to deal with the road sludge that usually covers each one. My husband, who hates pennies, would leave them. In fact, he may have even been the one to throw them down because he doesn’t like puny coins weighing down his pockets. “I’ll just leave it for someone else, send them a little luck,” he admits. But like I said, I didn’t want to tempt fate. If I didn’t pick them up and then went on to have a really lousy day, whose fault would that have been? Truthfully I didn’t really want the grimy pennies, either, so right there on the spot I came up with what I think is a genius idea. I picked them up, and then one by one, tossed them back on the ground, scattering them around the parking lot for others to find and be joyous about. Convinced I had done a decent thing and changed the course of destiny for three soon-to-be lucky people, I went into the store and prepared to treat myself to a cup of coffee to celebrate my new intelligence. Wouldn’t you know, there was someone chatting up the barista. A long story short, it was a very nice barista and a very nice man and after striking up a conversation with both of them, the man actually bought me my cup of coffee. In my world, there are few things as fantastic, fabulous, wonderful, amazing, spectacular, etc. as a free cup of coffee. In all seriousness, it sends me into smiley giggle fits just thinking about it. Call it luck, call it coincidence, but I would be remiss if I didn’t attribute at least a few sips of the java to the luck of the pennies in the parking lot. As it turns out, this lucky penny thing is nothing new. For centuries people have considered copper a serendipitous metal, because copper was seen as a gift from the gods, and anyone who carried it was therefore protected from evil. Others thought the luck came from just being a free piece of money. And for some people, only pennies that are heads-up are the lucky ones, because in a world of only good and only evil, even ancient cultures believed that heads represented the positive and the measly tail came straight from the dark side. And believe it or not, lucky pennies have even secured their own obscure holiday. 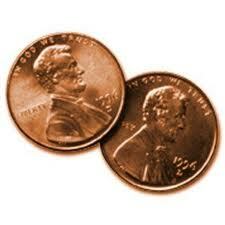 May 23rd of each year is supposedly Lucky Penny Day, a holiday with an unknown origin, but a great day for someone with a few pennies weighing down their pocket to toss them out and make someone like me very happy. Almost as happy as getting a free cup of coffee. The strangest thing about my day of lucky pennies has an even better ending. After my morning of luck times three, that evening I was at yet another grocery store, walking through aisles and thinking about what happened to me that very morning. Suddenly I looked down to find – you guessed it—another penny. I just had to pick it up. And then I just dropped it in the next aisle, the pinging sound of evil-thwarting copper landing on the tile floor, laying in wait until the next lucky person walked by. Plug it in, head outside. Slow Cooker fajitas!